Emily plays on the old forestry team called “Burn and Salvage”. 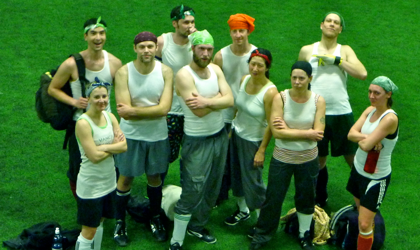 Tonight they had to play “Club Foot” the Fisheries team, a big rival, so they all dressed up as thugs. It was a great game and the outfits were definitely worth the late night drive to the Sports Park for a beer. Skiing the Palmer in February!! Really? ?